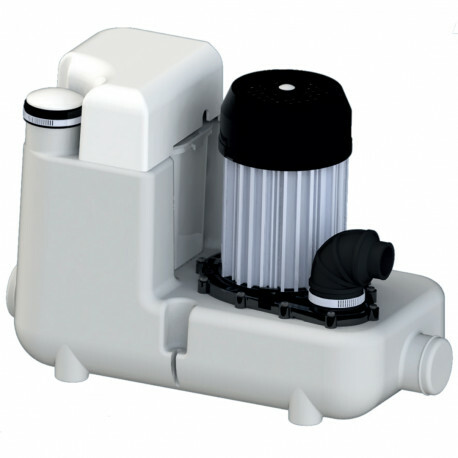 SaniCOM 1 model drain pump incorporates a 1 HP pump build into a collector basin and is intended for use in commercial kitchen drainage applications with water temperatures up to 194°F (incl. dishwashers, washing machines, etc., where these are installed below the main sewer line). The basin features 1" discharge, (2) inlets (2") w/ built-in check valves on both sides and 1-1/2" vent connections. Low positioning of drain inlets also allows for use with showers and bathtubs with a minimum of 10" base height. Dimensions (L x H x D): 24" x 13" x 9"